Roy O’Connor LLP reaches billion dollar settlement for tainted blood victims. 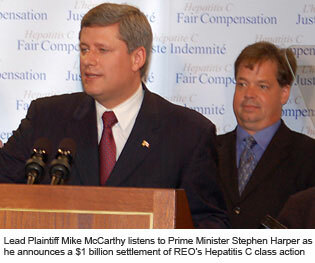 On July 25, 2006, Prime Minister Stephen Harper announced that the federal government had agreed to settle the Hepatitis C class action brought by Roy O’Connor for over $1 billion. The settlement is one of the largest class action settlements in Canadian history. Roy O’Connor is counsel in a class action against the Federal Government on behalf of people infected with Hepatitis C through blood transfusions received in Canada before 1986 or after 1990. On July 25, 2006, the Prime Minister of Canada announced a $1 billion settlement of Roy O’Connor’s class action. The Settlement Agreement in this matter has received court approval across Canada and compensation is now being paid. Peter Roy leads Roy O’Connor’s Hepatitis C class action team. For more information and updates on the settlement, contact us by email at info@royoconnor.ca.